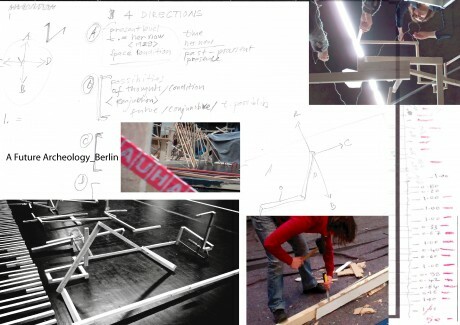 The Berlin slot (March 2013) is conceived to dig deeper into practices of collaboration, its conditions and politics. In the context of an already given art space, we create a walk-in ‚social plastic’ (Joseph Beuys), a habitat of togetherness inside a dance studio. 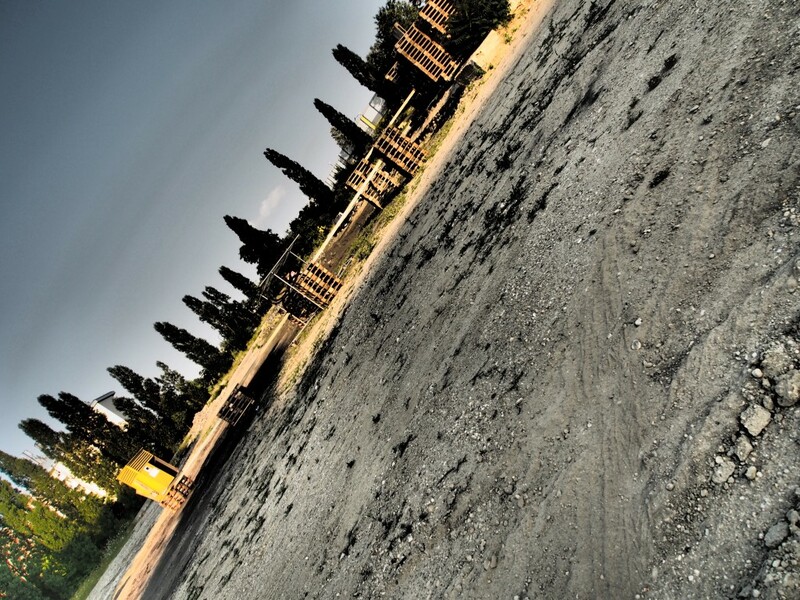 Moving on to Vienna in July/August 2013, together with Viennese residents, the international working group may set out to create a village-like compound consisting of huts, dwellings, houses in a public park, aiming at sustainable structures. For the Cairo slot (autumn 2013), the group invites activists, artists, art makers to concertedly create a space designed by and dedicated for e.g. the contemporary performing arts. Thus reflecting upon the needs by doing (what is contemporary art? who is doing it? who participates? how does this reflect a new society?) we aim at stabilizing a social field in favour of forceful political consciousness and confidence. The construction sites in these three cities are meant to facilitate monuments of togetherness, to erect (con)temporary social architectures, to re-claim space as public domain and civic right. Both in Europe and in the Middle East, we are in need of spaces where we can develop and exercise „civic imagination“ (Okwui Enwezor), a force of togetherness that condenses in a common creative practice. We are in need of spaces for encounter where we condition and instigate an understanding of „agonistic plurality“ (Chantal Mouffe) in order to challenge the notions of community and communality. The question how shall a community look like where communality can be produced within necessary difference is of utmost urgency both for the future of Europe in its present post-democratic state and the given transition period of Egypt and the Middle East on its way to democracy. We assume that performing art, its practices, discourses, theories offer an appropriate platform for these questions which at the moment seem to be unsolvable on a social level. Since they are a) too complex for the given political agents and their stratagems, and b) since society doesn’t hold open any spaces to develop possible models which may answer the questions at stake other than artistic ones. We comprehend the multiple social crises as we see them in different societies to manifest themselves as ‚crises of space’. In order to open ‚Other Spaces’ (Foucault) we count on the competence of choreographers, dancers and other relevant practitioners of space taking. For besides creating movement, choreography also renders visible the space in which movement takes place. Thus, space is never abstract, but foremost a social category. Choreographic methods then allow for contemplation about given spatial practices and look at them as cultural phenomena. The buildings, habitats, spatial structures we aim at allow for spatial reflection and social emulation. In regards to the local social conditions both in terms of processing and use, we shall create spaces which not only allow for asking the aforementioned questions but are foremost interested in tackling these questions within the process of building itself. Henceforth we set out to manufacture an ‚agora’, a public space for settlement with the social protocol of the agora itself: the title A Future Archeology mirrors the conviction that allegedly grown social structures have to be revealed, to be dug out to understand their constructedness in order to create new conditions for an alternative future. Since the beginning of the project’s collaboration, we have been interested in putting individual artistic styles aside and rather look at potentials and conditions for politics instigated by artists, politics of art production, and cultural policies. Regarding ourselves working in the field of choreography and being engaged in choreographic thinking, the notion of creation and mobilization of space is in the focus of our practices. One of the main questions sets out to create a shared space of being and working together, a space that ties together artistic practice and theoretical reflection, that is nourished by mutual interest in order to provide a space for understanding and creating politics. The political and social cataclysms taking place in Egypt and the Middle East render questions about spatiality even more urgent. Across the Arab World, modes of and channels for public expression, moderation and mediation are up to today completely controlled or suppressed. The Egyptian upheaval of disenfranchised citizens against their brutal regime could only gain momentum as it successfully turned Tahrir Square into a public space, rendering vox populi internationally audible. The square in downtown which until then was a neglected spot on the mental topography has gained more than a symbolic role in the process of democratization. The outpour of masses of people taking to the streets, directing and formulating a public discourse, very reminiscent of the ‚agora’, offered a direct, immediate, and urgent mode of expression and formation of what could be termed a process of ‚civility’. The revolution’s most striking feature has thus been the reappropration of public space by the people to become a constitutive space. Yet, the lack of democratic protocols in the past has instantly put tremendous pressure on public space to fulfill too many roles in the self-representation of a nation in no time. And nation building is still pending. From a non-Egyptian perspective, media reports on the revolution and its aftermaths seem to have struck a chord in diverse strands of Western society. Since people seem weary with what they experience as capitalist democracy, they eagerly take up the spirit of protesting and publicize their critique of capitalism. Yet, whilst in the so-called West, repoliticization of space aims mainly at abolishing neoliberal tendencies and corporate privatization of the public sector, and thus at reestablishing commons, in Egypt it is about guaranteeing the right of citizens for free speech and free assembly, the right to live in an uncontrolled society, to be governed by an elected parliament, to put an end to political nepotism, in short: to establish a democratic system that deserves its name. And Western democracies are not safe at all either. In fact, they are endangered by the so-called economic crisis and the forces that are responsible for it. They are also in danger because their peoples tend to confuse policies with politics: whereas policies create diverse sets of rules to regulate and save interests of a few by establishing ideological and moral matrices to saveguard the needs of a potent minority, politics have to provide the difficult means to maintain conditions for mutual negotiation in order to grant the same rights and duties to everyone. And since corporates or other lobby groups pursue their policies by taking advantage of the underlying democratic principle provided by politics, it seems to be much easier for them to sell their agenda and promote easy decisions. Balancing different agendas in order to monitor that danger is a highly important task for democratic structures which needs attention and civic commitment. And yet any comparison of the Egyptian revolution with the Western movements doesn’t seem to be appropriate. Glorification of the developments in Egypt by the West as acts of a people on their way to democracy speaks much more about the needs and projections of their own political short-comings. In fact, there are more differences than similarities one can observe looking at the current situation in Egypt in regards to public movements (such as Occupy and other leftist initiatives) in Europe. The body politics in Egypt at stake lead to another question asking if political space will be accessibly at hand once the aftermaths of the revolution have reached their aim, once parliament has seized control over the military somehow lurking in the dark and the president who is ruling the country without any legislative control; what if the momentum of a political practice as it is executed at the moment drops once politics is handed over to (elected) politicians who rule by the power of paper, by the power of laws and legislation? What if the country follows the choreography of a democracy but neglects the performance that is needed to protect themselves from policies that turn public space into a space of commodity, into a space of private interest? What if the idealistic power of envisioning one’s own society dries out? In order to safeguard and make visible still important „civic imagination“, a term coined by Okwui Enwezor, the project A Future Archeology tries to create a potential space for ‚a future’ and wants to set its conditions at the same time. We are interested in creating a space that conceives of the future as a site of archeological excavation of ideas and practices which haven’t gained momentum so far. We want to historicize the future of society and politics with the help of choreographic thinking and spatial practice. We don’t understand choreographies as mere aesthetic, but rather as multiple methodologies for the creation of political spaces and social knowledge production. We want to set an example of and for togetherness, both a theoretical and ‚real’ space accessible for the public at any time as the political crisis we are facing right now is foremost a crisis of space: a less and less irreconcilable clash of private and public space, of advancing policies versus agonistic politics, of conditions that manifest themselves and the multiple reverberations stemming from it, crystallizing in everyday life. Thus, A Future Archeology aims at taking part in the project of re-democratization, making use of artistic practices and discourses, daring to dig out the future, daring to instigate a social archeology in order to create an inventory of social futurity. A main constituent of this project is to create and build spaces in which sharing, agonism and production of community can be negotiated – achieving the creation of „locus agonistes“ (Enwezor), of spaces of common dispute and mutual creation, of future of society and a society of future. 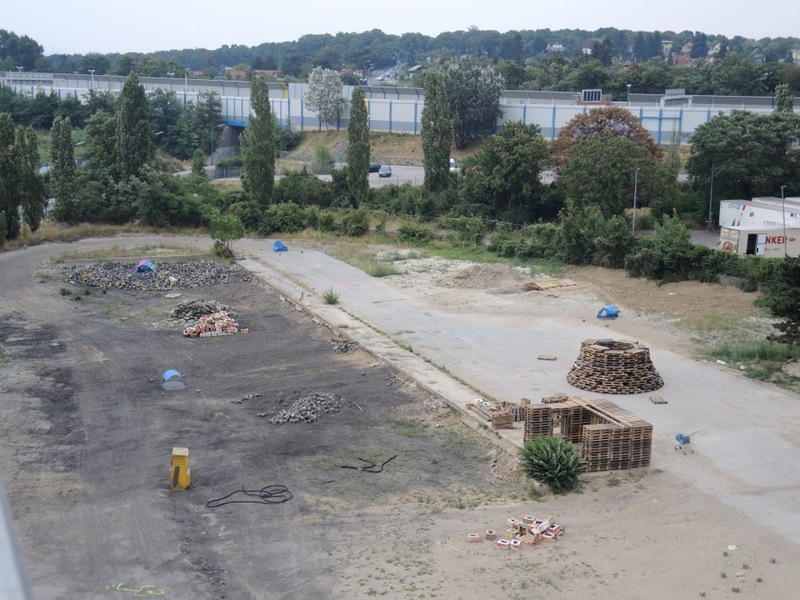 In the course of five months in 2013, a dozen artists set out to instigate a practice on that matter by commiting to the process of building together, reassigning a different notion of space and investing a practice of mutual effort, negotiation, and agonism in Berlin, Vienna, and Cairo. We definitely mean to construct buildings, taking the local conditions and particularities into account. The concept of ‚building’ embraces any kind of forms a building can take on during the process. Taking the shape of a simple hut or a complex habitat depends on the negotiations the partaking artists undertake with each other. It’s not our aim to layout a blueprint beforehand, since we conceive of negotiations to be an important and basic part of the creative project. We aim at creating a multitude of spaces for mutual encounter by creating the conditions that constitute the work as such, by conceiving and building the spatial core that is needed to work and exchange. We literally erect a construction site where we stimulate democratic structures, becoming a group of builders that has to find rules of togetherness, of sharing, of a common practice. We are steered by the convictions that participants are mutually interested in one another, moved by one another, inspired by one another, sharing practice in order to exercise democracy and agonistic togetherness. We aim at achieving cultural knowledge by intercultural exchange that goes beyond lip service of cultural policy. In order to be able to meet with the given challenges and at stakes of the immediate environment and neighbourhood, we are interested in a context-sensitive practice that integrates local knowledge and counsel. We want both the process of construction and the constructed building itself to be used after the building process is over. Our understanding and projection of social, aesthetic, architectural space aim at sustainability since the buildings should grant access to a multitude of diverse bodies afterwards: How can we institutionalize the buildings without running the risk to solely administrate it? To what kind of local and international requirements do we want to find a response? Which kinds of artistic work are the buildings supposed to bring forth, if at all? – process/product are both cause and result of a common learning process in which everyone is equally regarded to be (not) knowing. Thus we share a working and thinking practice that is encountered and executed from the same starting point. For we want to start from a ground zero and attempt at finding out what are the steps to be done to get ahead. Ground zero is not supposed to dismiss the diversity of knowledge, to the contrary, it is supposed to support diversity for we don’t conceive of knowledge as personal status. – we conceive of collaboration as an action without assignment. Doing what is necessary without neither imposing it nor letting it go. Laissez-faire, often understood as ‚anything goes’ and thus suspected to be arbitrary, means for us to ‚make doing’. There is an important ethical momentum which favours the question of ‚what can I do’ rather than ‚what am I SUPPOSED to do’. If the individual wants to initiate changes h/she is asked to undertake necessary steps instead of waiting for them to be undertaken. Thus our working space is free of any kind of policing. – we act on the assumption that creativity is a basic artistic motive that articulates itself in a practice and willingness to create. It’s this understanding of creativity in the sense of self-empowerment for action that we advocate with this project. – production of process and product follow a mutual interest within the participants that is based on being willing to understand each other. Mutuality is based upon the attempt at understanding the other, but not on mutual agreement. To agree or disagree necessitates an attempt at understanding in the first place. This is subject to negotiations where the conditions of understanding themselves are subject to scrutiny. – responsibility stems from responsiveness, in the same way as response stems from responsibility: shared responsibility does not mean to ask for already given answers, but rather looks for responses. – we don’t attempt at distinguishing between value-adding or non-value-adding labour. Any process taking place within these months is part of the building process. Accordingly, we don’t distinguish between material and non-material work, as we don’t distinguish between result and process of this work. The project has already begun. Our first stop at Uferstudios Berlin in March 2013 didn’t only produce a series of spatial sets or saw intense public encounters; we have also gained physical experience, manual skills we are now able to apply during our Viennese phase. In general, as knowledge and experience grow the more people are involved in the project, we are eager to present the project at diverse institutions and invite them for collaboration. Taking on the concept of a platform, A Future Archeology is to be developed continuously to become a space of reflection also outside of Berlin, Vienna, and Cairo since we are convinced that our questions raise translocal interest and gain thus international relevance.